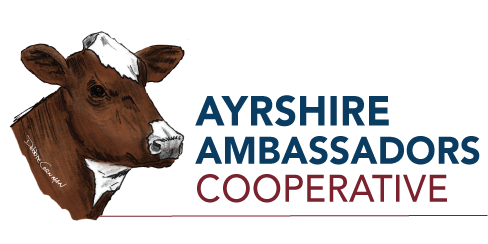 Each year, the U.S. Ayrshire Breeders Foundation awards a grant to one or more deserving applicants who are working to ensure the future of the Ayrshire breed. This year’s grant of $3,000 was awarded to the Reymann Memorial Herd at the University of West Virginia in Morgantown. The grant will fund two different projects. The first project, managed by Berkeley Clark, will compare the Ayrshire and Holstein breeds. She will look at DHIA data, milk components, calving interval, lifetime days in milk, Somatic Cell Count, age of first calving, and age at last lactation in order to create a comparative lifetime value of Ayrshires vs. Holsteins. She would like to look at data from other farms that own Ayrshires and Holstein, so she is looking for people to share records to aid in the research project. The second project will be completed by Morgan Carroll. She plans to do research on dairy food and cheese-making. Subtopics on this are milk samples for milk fat, protein, lactose, Milk Urea Nitrogen, Somatic Cell Count, and milk for complex lipid profiling. She will examine feed efficiency, rumen fermentation, and nutrient utilization, as well as evaluate metabolic health and nutrition. She will also consider genomic testing, feed analysis, bioinformatics, and dairy economics. This is significant to understand the effects feed and breed have on milk constituents and cow Microbiome. Both projects will be completed under the guidance of farm manager Ben Walsh.